Sunday was even warmer; I spent the afternoon scooting around the burbs with the Giant Swede, doing our part to express Consumer Confidence. We were not alone. You looked at the checkout lines at Best Buy, and you saw Americans of all varieties – Hispanic, Asian, Anglo, Somali – queued up with TVs the size of 3rd world dwellings. It's a good thing. Home for burgers on the grill with milkshakes. Now I’m at the kitchen table. It’s warm. The wind is stern. “It’ll snow in a week,” said the Swede, and he might be right. After this weekend, no one would particularly care. Ladies and gentlemen, I give you the “retro-stylish” upscale Cuisinart coffee maker, which has accomplished something no other coffee maker I’ve owned has ever done: it peeled the paint off the wall. For some reason it decided to stop making coffee Friday – six months after it joined our family of appliances, it went senile on me. It would make a cup, then forget what it was supposed to do with the rest of the water. . . oh, perhaps I should convert it all to steam? Jolly good. Which it did. It vaporized 11 cups of water through the back, and the steam flowed under the cabinets and took off a strip of paint six inches long and one inch wide. Well, we were going to repaint the kitchen anyway. It’s busted. I ran the Cuisinart through six cycles, and half the time the “Self Clean” light came on, as though it’s feeling dirty and cannot scrub away the shame. I hate to part with it. Yes, it has a three-year warranty; should I mail it away at substantial cost or just admit defeat? Well, ladies and gentlemen, I give you the matching Cuisinart coffee grinder, which has a nice feature: the beans are pulverized in a cup you can remove for transport to the coffee maker. Best of all, it matches. Only problem: now and again the blades whirr up when the cover’s off. This is akin to a pistol that fires with the safety on. Behold, my Cuisinart toaster. Don’t think I’m not watching this SOB, and expecting the worst. 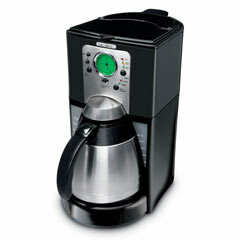 So how will I make coffee until the Cuisinart returns from the sanitarium? I got one of these. It’s a Mr. Coffee. See that green circle? It’s a clock, a timer AND a sonar readout. I love it. Half the price of the Cuisinart, too. It also has a very unique feature: when you pour the water into the unit, less than seven cups spill out on the counter. I know, I know: impossible! You say. But it’s true. The Cuisinart demanded that you angle the carafe carefully and control the flow, lest you win the Onan award for spillage. The Mr. Coffee has a grill on the back. Dump it in, turn it on. I’m happy. As they continue their investigation into whether they were hoaxed, CBS officials have begun shifting their public focus from the memos themselves to their underlying allegations about the president. Rather said that if the memos were indeed faked, "I'd like to break that story." But whatever the verdict on the memos, he said, critics "can't deny the story." As the days begin to blur for Josh Howard, he embraces the same logic: "So much of this debate has focused on the documents, and no one has really challenged the story. It's been frustrating to us to see all this reduced to a debate over little 'th's." And if it was later proved that someone did send a 1973 LTD back in time, and it showed up in a Titian painting? No one would buy it. Fruit of the poisoned FOREST, at this point. Note: I finished watching “Equilibrium,” which truly is “1984” meets the “Matrix” meets “Brave New World” meets any number of movies where the budget for lighting made up for the deficiencies in the budget for sets. I heartily recommend this film, for those who love this sort of moody dystopian nonsense. And I wonder why I never get quoted in movie ads. Note: there is a website devoted to learning gun kata. I quote: Where did Gunkata originate? From the mind of Kurt Wimmer, director of the film EQUILIBIRUM. So essentialy, this is a fictional martial art. But the forms are real. If you hear that Rather is coming out “guns blazing” in his own defense this week, you’ll know where he learned to shoot.